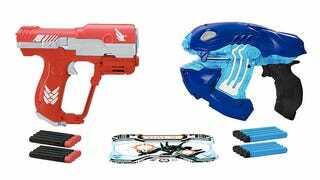 We got our first hands-on with Mattel’s new BOOMco Halo-themed blasters back at Toy Fair, but it looks like the first official opportunity for everyone to get their hands on the new additions to the line will be at the San Diego Comic-Con next month. The UNSC M6 Blaster and Covenant Plasma Overcharge Blaster will be sold as a two-pack in a collectible case inspired by the ammo supply crates in the game. The $30 set can be pre-ordered over on MattyCollector starting on June 9, but has to be picked up at Comic-Con. Boo. You can also wait to buy it at the convention if you’d prefer to check it out in person first, although the risk of them selling out is much greater if you drag your feet.